Yesterday wuz very eventful to say the least. I had da day to mahself so what do i do? First thing as i rezzed inworld, I gots a call from mah bro Franzi to join him, Kenshi n Rocco at Jake's. Dancing with mah bros, brings back memories, so much fun, a bunch of kittehs in a corner right next to Syriana spinning out schmexi tunes to shake our tails to. A bit laggy there but fun nevertheless. After Syri's set there's a fashion show where the models just appeared to be puffs of white clouds to us (bad lagg, bad bad) so we took off to the brothers hangout. Franzi, Kenshi, n Rocco went in and I had to get ready for an interview for Myst club. Going in as a dancer. I know my work well, being trained by and worked with some of the best out there *me winks at Franzi* but yet I still felt nervous. Every single time I go to an interview I gets nervous. Especially as they have a panel of four there. Mah fingers were shaking that I could hardly emote mah thanks to them as they tipped me, they wanted to see how well we emote see. Well I musta have done good as I got mahself a job now. Yays! Not a bad environment, no fancy lights that get in the way, get to keep all tips, if tips are below L$1k the management would top it up to 1k. And if it's over then we donate 10% of anything over 1k to the club to help with its operational costs, pretty fair i think. After da interview I rejoined our brothers to tell them da gud news. Kenshi was already asleep on da rug. Chatted a little bit then had to head to RL to do some stuff, leaving my bros to sleep by da fireplace on da rug. As JC puts it "bad things happens in RL" well i think that's how he put it or something similar. On mah way home I was involved in a car crash, thankfully no one was injured but mah car was pretty badly smashed up in front. I wuz shaking all over. Called da insurance people to make a claim then there was another dent, this time in mah wallet *sighs* Could have been much much worse. Didn't know who to turn to. I was home alone. I came inworld hoping dat mah sunshine would be there, knowing it's still a bit early for him but hoping anyway. Franzi had woken up and took me to the basket for a cuddle to sooth mah frazzled nerves. He's good like that mah bro. I love him so much. JC also checked in on me to make sure I'm oki. Thanks guys for being there for me. Later that evening when I got back from dinner, Very ran in thru da front door and embraced me, *purrrrrr* so good to be in his arms again. I fall more in love with mah sunshine every day. He makes me smile evey time i think of him. I couldn't wait to show him my latest creation. 2 weeks has past and I still haven't given my hubby a wedding present. Hmmm, what to give him? I had an idea to commision 2 rings made up as a sign of our commitment to each other but they don't come cheap and I as yet unemployed can't afford it. Anyways then it occured to me dat I could craft them mahself. I already have da design in mah head. 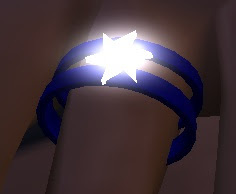 2 deep blue bands to signify Very and I (cause it's our fav colour) and a bright shining star in da middle (an inspiration from da southern cross tatt on mah hubby's chest, oh I haves star tatts too, hehe =^.^=). Thankies to Levi who gave me sum tips on how to make them, I set to work. No easy task makin stars I must say, but then I'm a noob builder. Here's a closeup of it...oooh shiney! =^.^= Look realy closely and you might just make out the inscription "Juz & Very 4 eva". I love you with every beat of my heart Very! Sorry to hear of ya prang - hope you recovered from it with no hidden injuries. Cars can be fixed - Nekos have nine lives? Ya did a bloody good job on that ring to - no doubt Very is tickled pink to receive it. Catch up with ya in sl one day.